The tendency to seek distraction and relief from unpleasant realities, especially by seeking entertainment or engaging in fun, tom foolery and total drunkenness. Escapisim– How often does this thought enter your cranium when you are busier than a one armed Plasterer in a war torn city? For me, many times- And especially at this time of year when things are flat out and even if I had 10 arms, I still could not scratch my Arse. 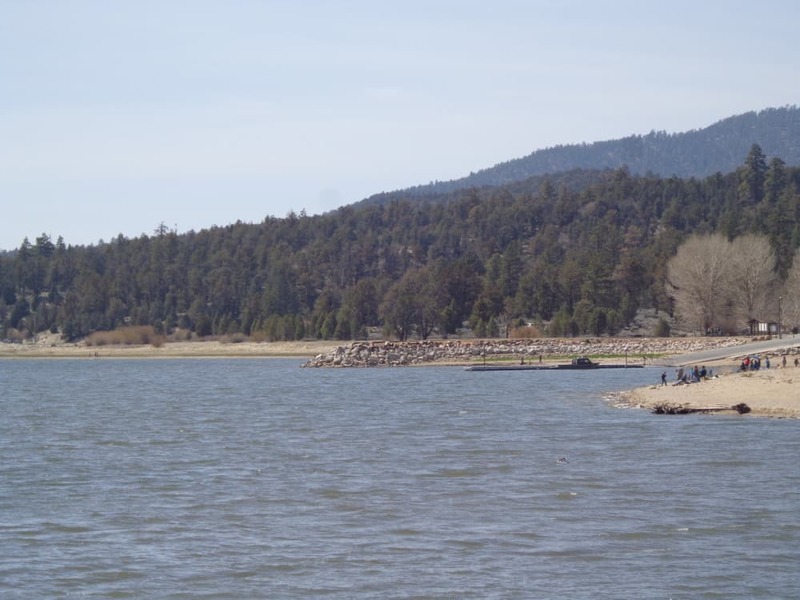 So when Jennifer- my girlfriend, suggested a cool getaway would be to rent a cabin out in Big Bear Lake and spend some quality time with her and some of my 59 Club brethren, well that’s all I needed to hear to realize that this would be a brilliant time away to relax and enjoy some fun time at the lake. This was the Cabin we rented, enough to sleep 12 and had all the cool amenities that we would require for a fun weekend of festivities. I was so amazed at the place and something I have always wanted to do was have a weekend away at the lake and here we are. The place was awesome, it smelt of old timber and felt as though we were on a Nordic journey and could of easily mistaken this area for a vikings getaway camp. Big Wooden front door what seemed to be carved by European slaves that the Vikings captured throughout their European advancement generously welcomed us to this huge abode. 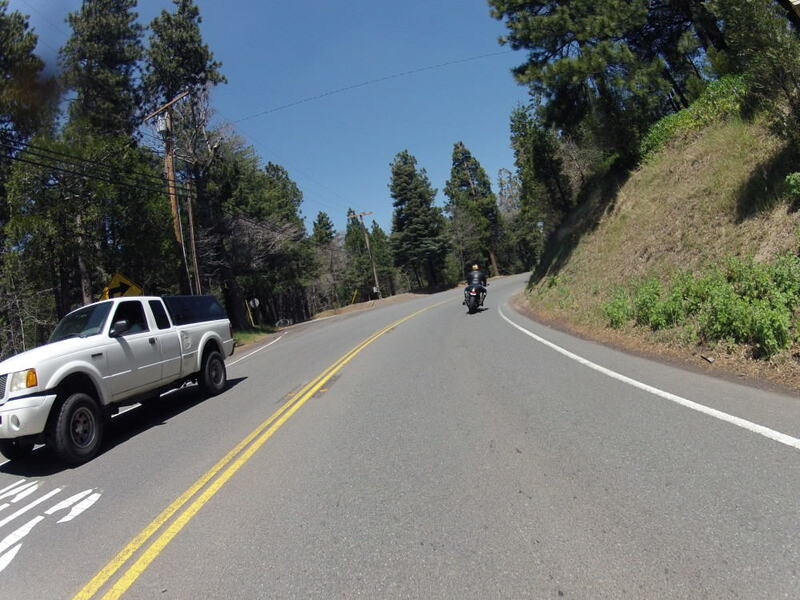 Even Bailey – our trusty mascot loved the area and the 7000 feet elevation didn’t really affect her too much at all. 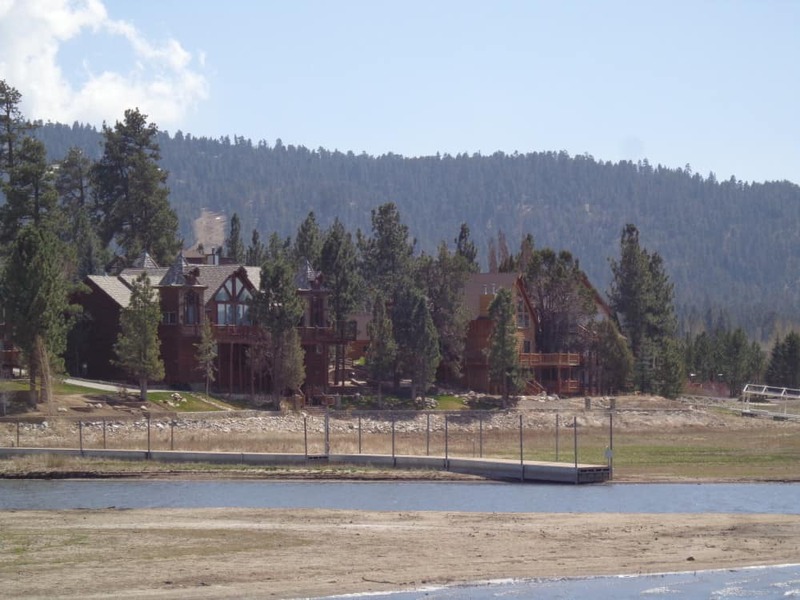 This was a super place for the 59 Club to have as their Spring break get away and I was sure happy to be able to spend time here up in Big Bear lake in Southern California. On our upper deck we had a view of the lake and the boats moored opposite us and watching the boats go out all day in this super breath taking area was something to see for a land lubber like me. With multiple levels this place was just a super getaway, we were on the middle floor and there was Timber carved wood all over the place. This was at the bottom of the Garden looking at our cabin. 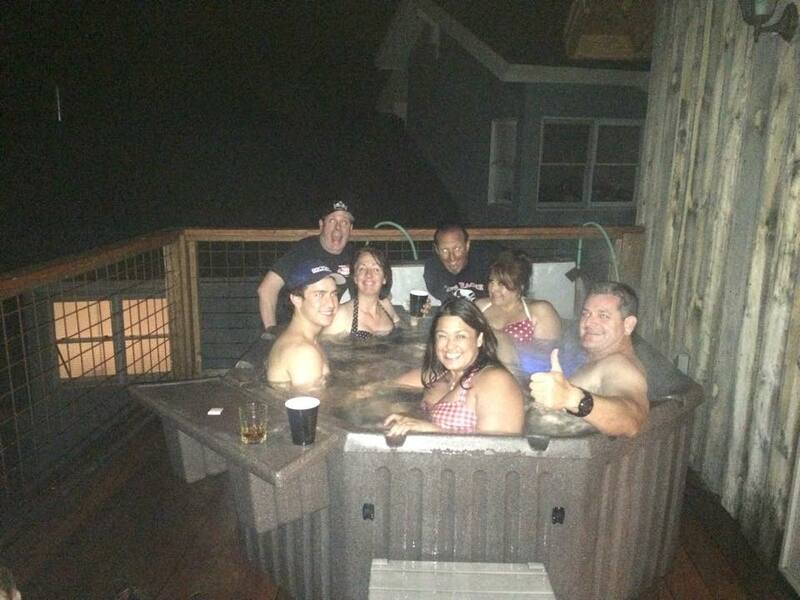 On the top deck was tables, sun loungers and a Jacuzzi. You can see my Girlfriend Jennifer at the top where we all spent many an hour, eating, drinking and enjoying great music and movies. 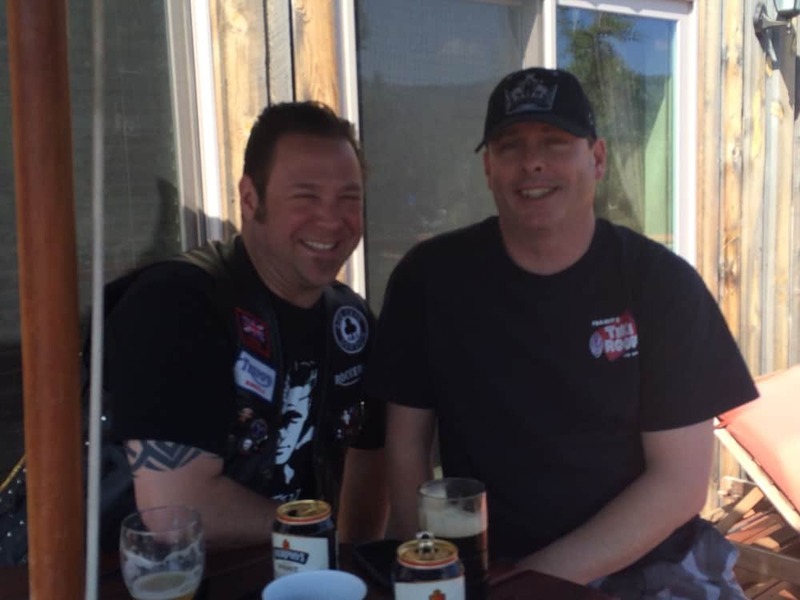 We also stuck our Club banner up as Andre Pine and his buddy paddy of the 59 Club San Diego made the trip up. Just the perfect time to relax and enjoy the surroundings, no more phone calls, emails and grinding of metal for a few days. We were on our way up the mountain when I grabbed this with the little camera, the temp was dropping fast as fellow Brit Mark baker starts to feel hypothermia creep in his joints, but we made good time and was fun going up the hill. 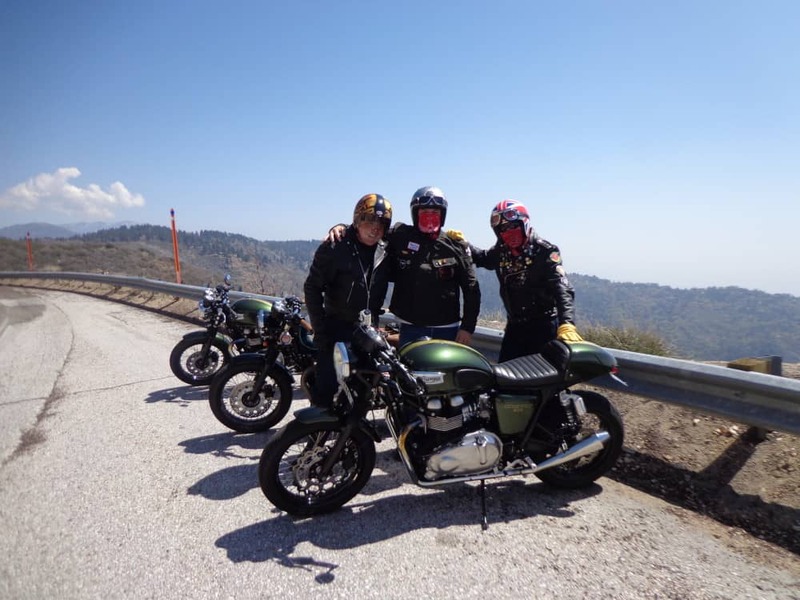 Here we have the Three Amigo’s Thruxtons sitting patiently as we stop for a bit of a rest and take in the sights. 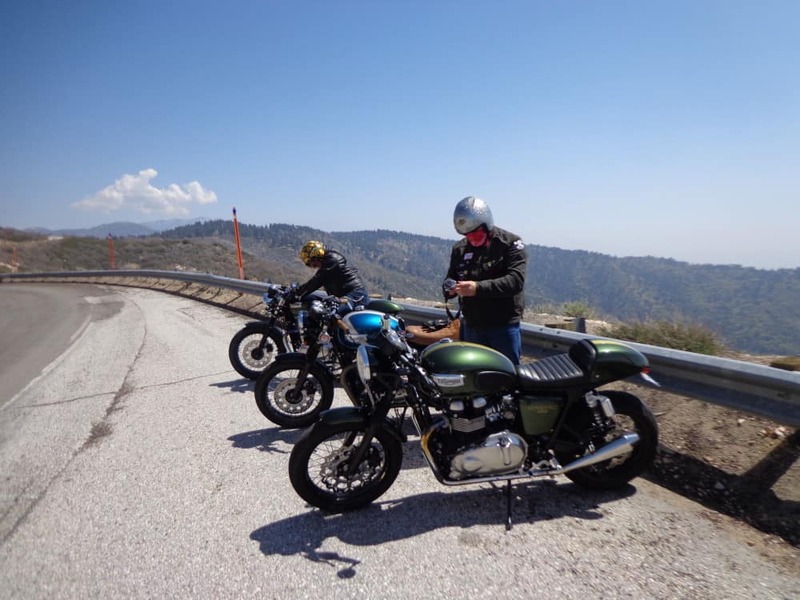 Here we are on the way to Mt Baldy as we wind our Thruxtons around the twisties with Super fine weather. Yes, we were having fun and as we are both Brits, we slung a few slang words about that of course fall of deaf ears! 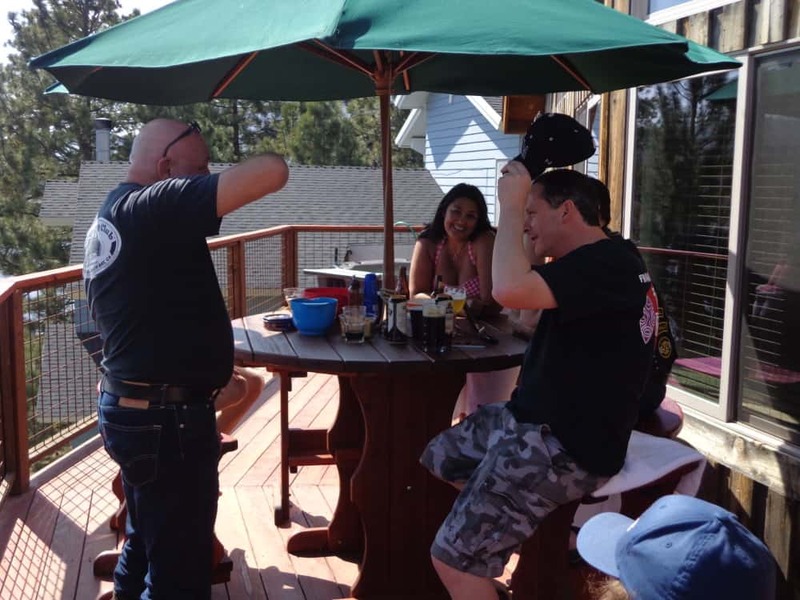 Having food, beer and relaxing as the 59 club blows off steam on a super weekend up on the lake. Below Andre and Paddy sink more beers than Submarines did ships in ww2. 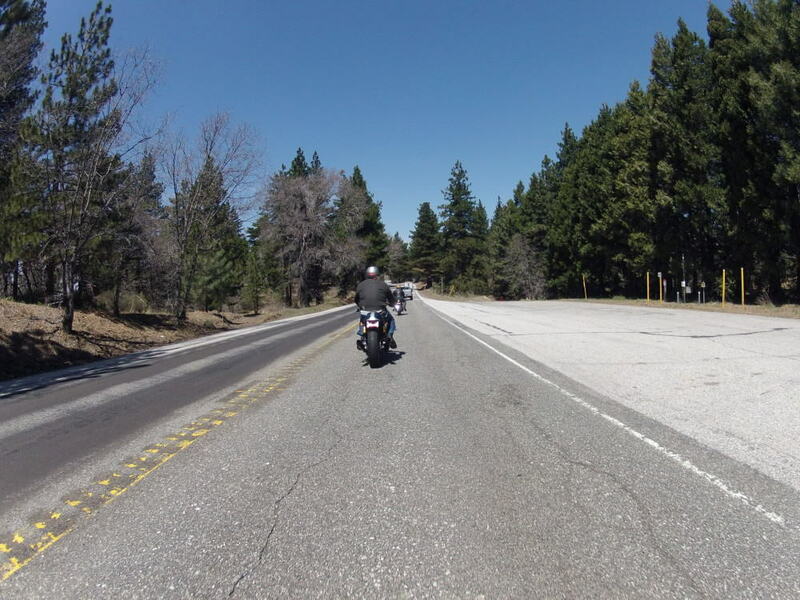 Below- The Three Amigo’s give it the Thumbs up as we hit the start of the climb up the mountain to Big bear lake, little did we know the temperature would drop faster than the inside of a British railway station waiting room. The Rim of the world, we pulled over to take a snap as this was some great winding roads and the view was breath taking, so made sure we pulled over to enjoy the views. 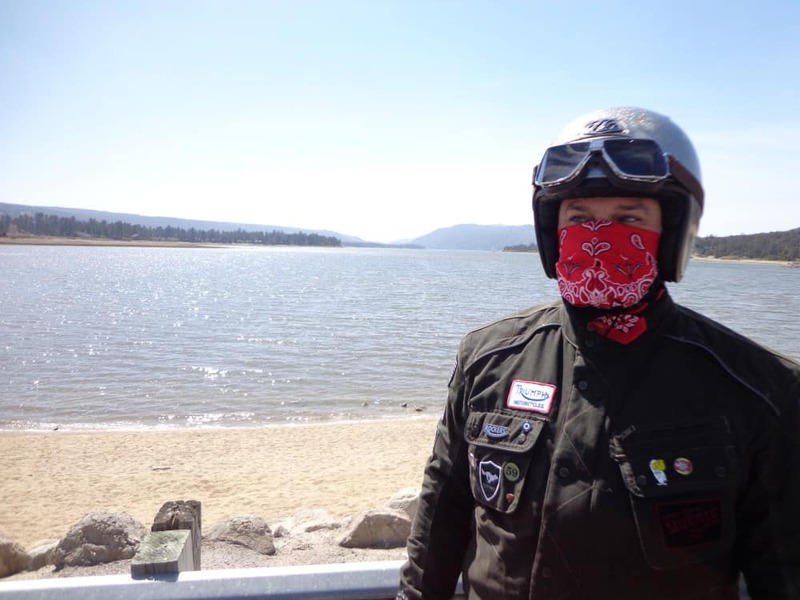 Big D calmly stands to get a quick rest, before we head off to higher altitudes and cooler weather, as Mark baker gets ready to jump on his steed and lead the way. 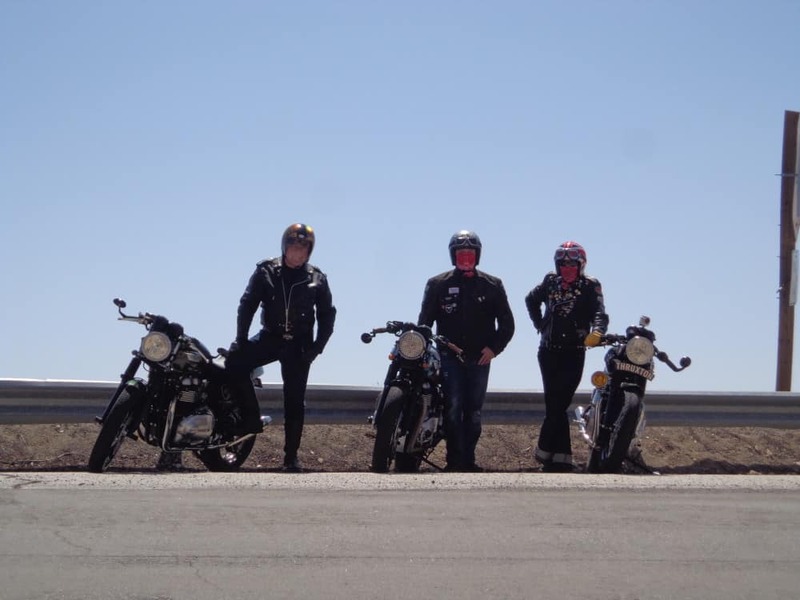 This was a great spot for a photo, and another Motorcycle rider stopped behind us and offered to take some pics for us, camaraderie is awesome up here. 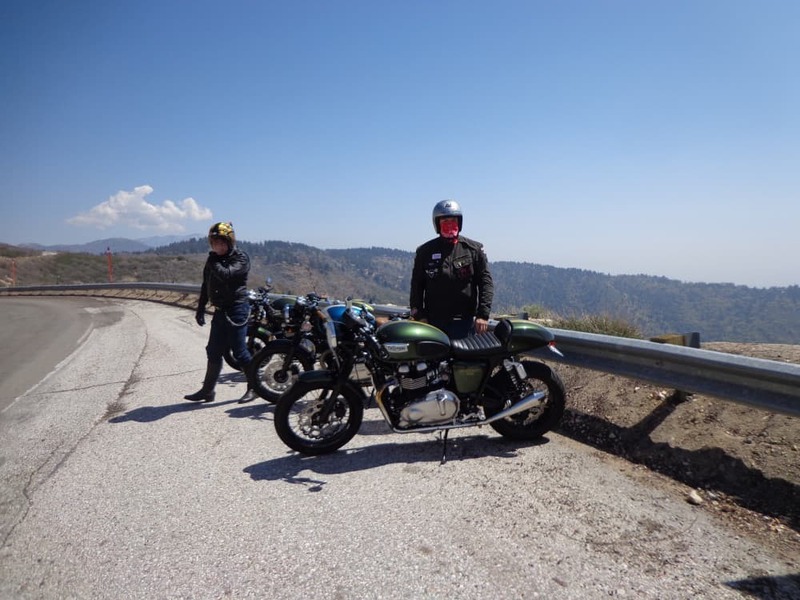 Enjoying standing at 7000 above sea level as we gasp for air on the mountain and with more riding to come, a super weekend, and some unreal winding roads to encounter. Another port of call and this time Dietrich stands next to his thoroughbred as we come down the mountain and stop right next to Big bears lake, a brilliant day for sure. 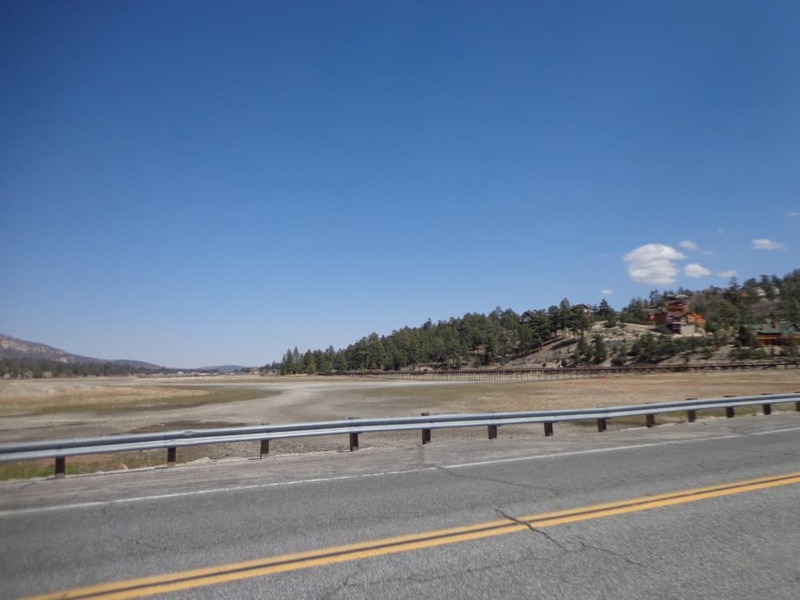 A scary sight here, the other side of the lake was a dry as a wallaby’s pouch, the drought has really taken effect up here and California needs to wake up to this real fast! Always fun riding with these guys, sore back, wrists and headaches were a plenty but hey- you gotta earn it up here and we sure all graduated this day. 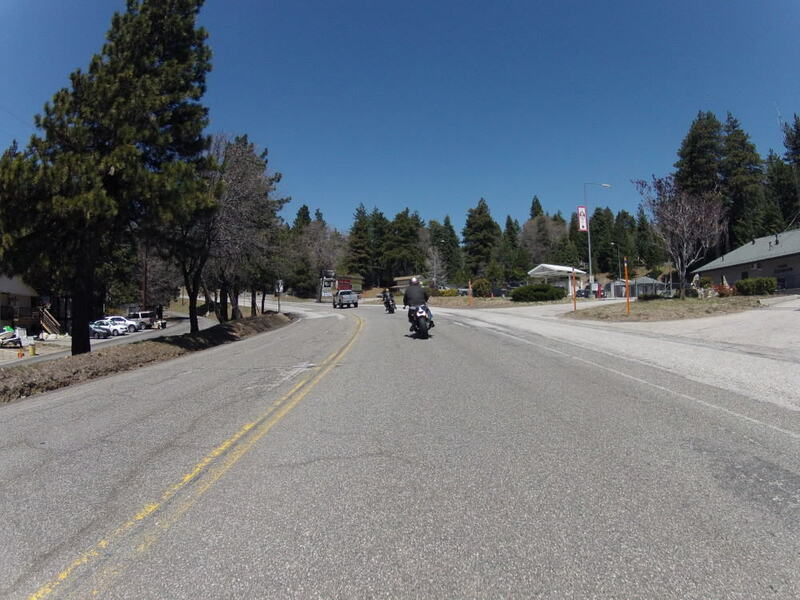 Our Cabin was just a few miles behind us on Big Bear lake and the views were just fantastic, seeing as we all had fuel injection we never lost any power at 7000 feet above sea level. Such a Phenomenal area, relaxing is not even close, this really does make you sit back and make a sigh of relief from every day work. I am sure there are bears in them there woods but they will lucky for us, still be hibernating, so no worries there as these bears certainly do still crap in the woods. All tucked up to stop 30 degree wind and any bugs that want to enter your gob as you gasp for air up on the mountain. 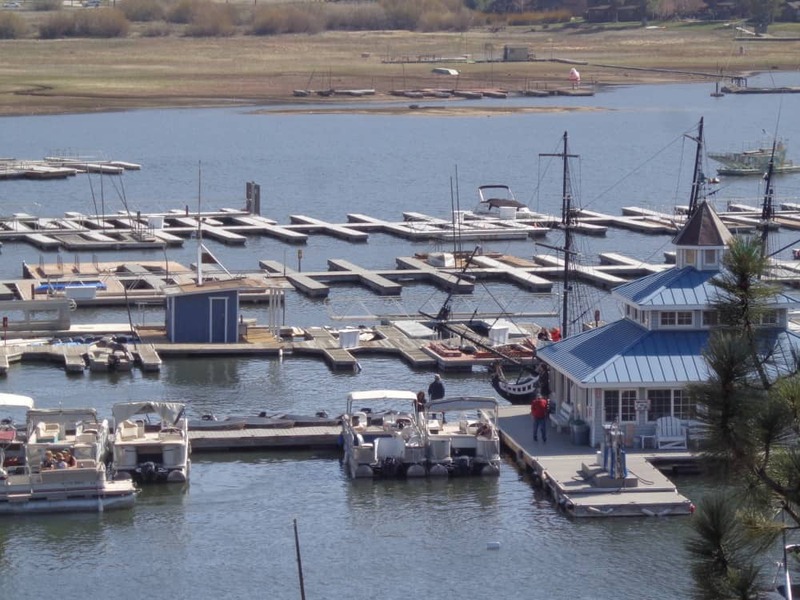 Opposite our cabin is where you could go to the little harbor master and charter a boat to go out on the lake for the day, maybe next time we shall try that as they had a pirate ship there that takes you for a jaunt around the waters. Paddy and Mark Baker discuss the way to do a German Salute if you had a stump for an arm! well, it looks like it anyway from the photo! My gorgeous Girlfriend Jennifer Smiles as she enjoys this weekend away. 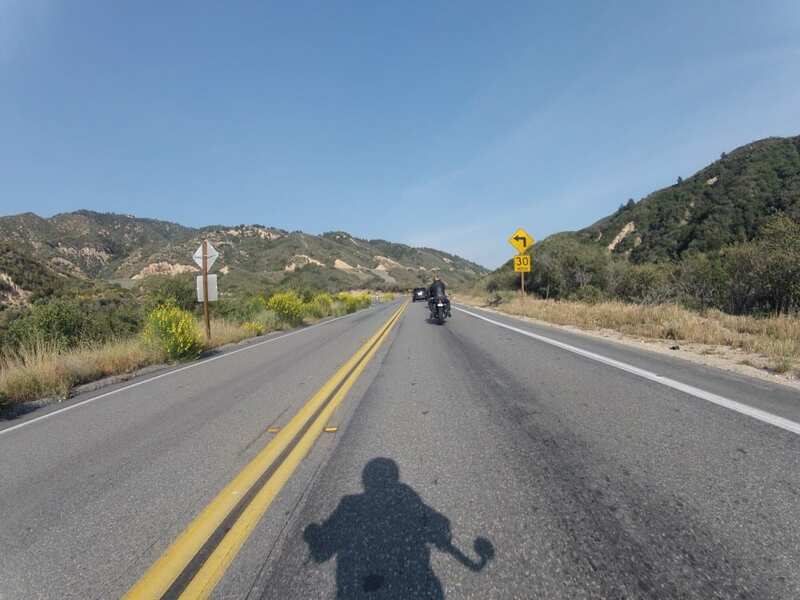 Here is some Video I took with my Old Go pro- not the best but here is me on the Thruxton having some fun as I ring her neck a little on these great mountain roads. 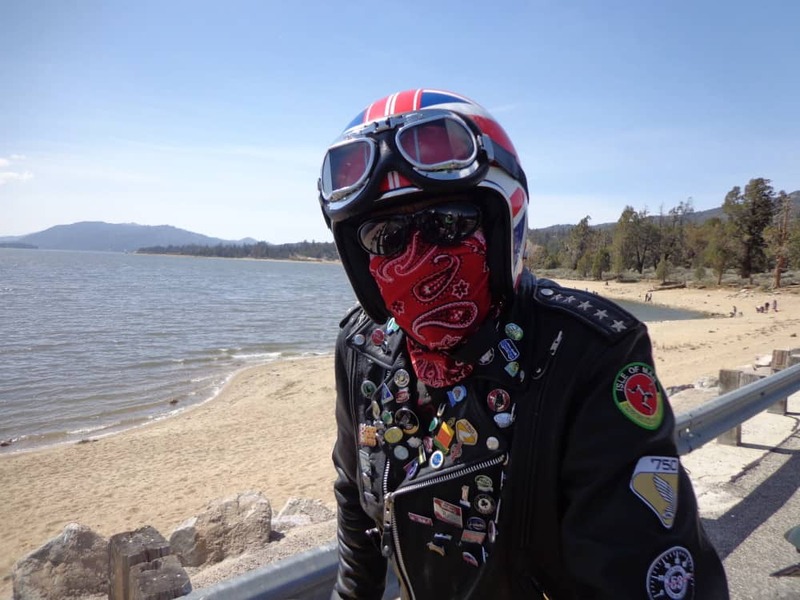 Here is one just for the lads, a little more riding around big Bear Lake, . Below is just a couple of shots with the Go pro, still trying to figure it out but at least you get the idea of what we were doing. 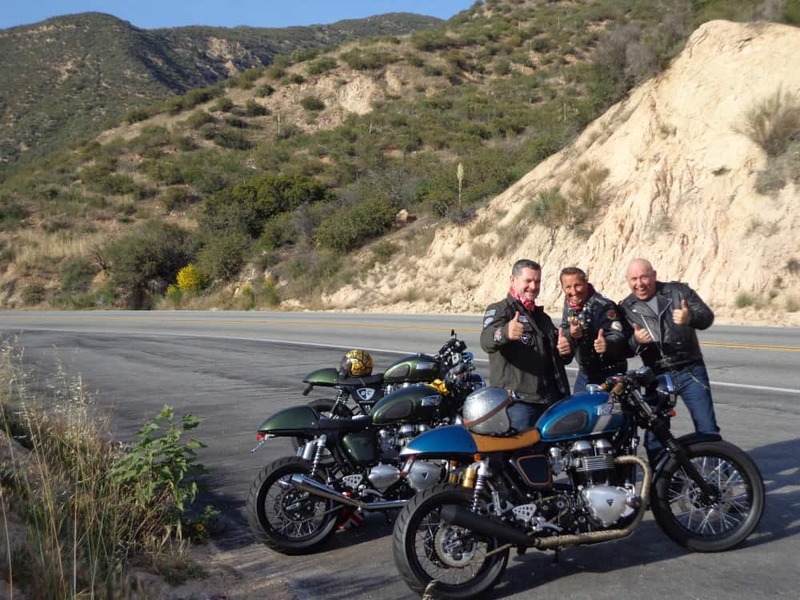 This was a real fun weekend that seemed to just fly by but many other rides coming up soon, so keep an eye out on the website and of course on meetup.com under carpys cafe racers. Thanks to EVERYONE from the 59 Club who attended as it was a real Blast and look forward ti the next adventure . 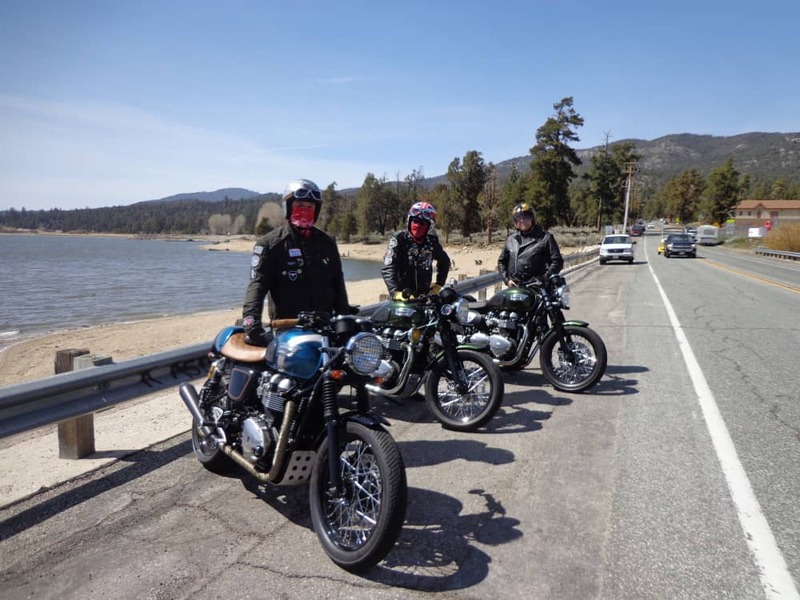 This entry was posted in Blog and tagged 59 club, ace cafe, Big bear lake, bonneville, brit iron, cafe racer, classic motorcycle, custom parts, megaphone, Motorcycle run, rock n roll, rockers, thruxton, ton up, triumph.